I'm a little behind the times with this one. 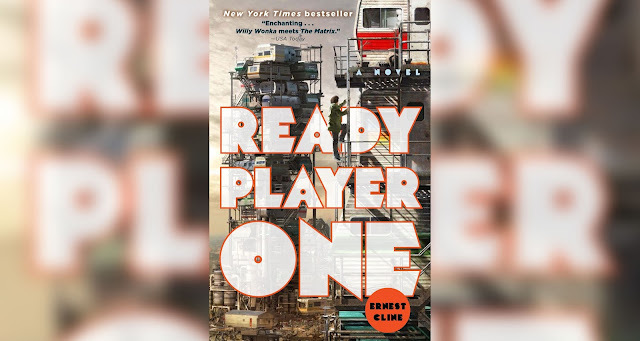 Ready Player One by Ernest Cline has been on the shelves since 2011 but I only recently had the opportunity to "read" it via the audiobook narrated by Wil Wheaton. I figured with the movie adaptation slated for release in March of next year, now would be a great time to catch up. This dystopian Sci-Fi novel follows the story of Wade Watts, a teenager in the year 2044 living in poverty. The earth has been ravaged by global warming and the exhaustion of fossil fuel resources, a depressing world where many barely scrape together a living with widespread unemployment, meager government benefits and in some cases, indentured servitude. Most of society is able to side-step this grim reality by spending the majority of their lives immersed in a virtual space called the OASIS. The OASIS is what Second Life wanted to be in its heart of hearts, a MMORPG that overtook real-world spaces and functions such as schools, libraries, and remote employment. The story focuses on Wade's pursuit of a very special Easter egg left within the OASIS by one of it's founders, the deceased James Halliday. Wade isn't the only one pursuing this Easter egg, many other "gunters" (short for "Egg Hunters") including the ominous tech conglomerate IOI, are in hot pursuit of it as the one who discovers the egg first will inherit the whole of Halliday's massive estate. I'm glad I happened to read this book after I've had a healthy dose of our current VR scene. It was much easier to picture a society in the grips of this better version of real life having lost so many of my own hours to gameplay within VR spaces using our primitive (by OASIS standards) VR tech. It made the premise so much more accessible for me, with the VR industry starting to gain a real foothold within the game industry today. I was delighted when I heard that Spielberg was heading the project, it seemed a perfect fit with Spielberg being such an icon of the book's heavily referenced time period. Apparently that was a little too on the nose for Spielberg though, as he decided to remove himself and all references to his work from the film adaptation. That quelled my anticipation for the film quite a bit. Though Spielberg was not the only icon of the 80's whose work was referenced, his work was a cornerstone of the time period and it seems strangely petty to pretend that the film's version of Halliday somehow ignored that same work while devouring everything else in nerdom had to offer. Though my enthusiasm for the film adaptation has cooled somewhat, I enjoyed every minute of the audiobook and can't recommend it enough. Wil Wheaton is a veteran audiobook narrator these days but I found that his love of all things nerd shone through in his reading of Ready Player One. Wheaton's joy was infectious and I listened smiling almost the whole way through. I encourage breaking up that almost 16 hour listening length a bit though. Smiling that much for that long causes a hurt that is a bit embarrassing to complain to others about.